Today I saw a white feather floating down over my head in Times Square. Anyone who has visited New York, knows that this area is full of people and usually very loud, crazy and more than a little dirty! (…especially in the summertime) It was such a magical moment and I took a mini-break from my busy day to observe its presence. When I see a feather, it makes me think that someone above is watching over me and always brings a smile to my face knowing that I’m not alone in any given moment. It’s easy to become so absorbed in our days and lives, that we never look up to see the beauty and magic in the world. Nature is always communicating with us, reminding us that we are connected to each other, as well as, a higher source of guidance. Feathers can remind to you be “light” in your heart and to see the “light” in your everyday surroundings. A friend forwarded me this image the other day… It made me laugh out loud! I have an August birthday, so I am a Lion by birth. Also, because I used to have a cat named Mosie who looked just like the kitty in the picture. His body resembled the kitty, but his personality was definitely like the Lion. We spent 8 years together as roommates, before he died. He was not my friend, or my son, he was my roommate. We struggled and fought and ignored and occasionally loved each other, but he was hands down the most loyal companion and highly protective. He had this whole self-image thing down. 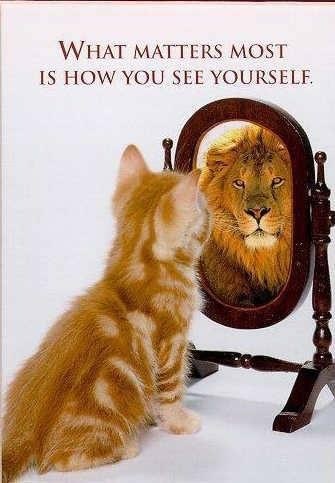 He saw himself as a LION every day. Even when he clearly looked like the kitty! Working in the fashion industry is all about image. It’s constant scrutiny and very subjective. One day you are IN, the next you are OUT. It can take its toll on your self-image over time. I often wonder if it’s really a good idea to bring young men and women into the industry so early… You have to be so strong inside. Today is a gorgeous day in Brooklyn. It’s completely clear and the sky and water are the most beautiful shades of blue… Especially the water. It’s that perfect combination of green and blue. I rode my bike to the Brooklyn Bridge to sit in the sunshine and have coffee. I positioned myself in front of the carousel which was full of little kids! There must have been some event happening, because I was suddenly swarmed by 2-year-old little boys and girls. My God, they are so cute and so funny. It was a bit like being swarmed by bees, but in a good way. What I noticed most about them, is they smile and laugh with their entire body… I mean how can you not be hypnotized by such beauty! They must have been handing out balloons for this event, because they were flying all over the place. The colors painted such a pretty picture against that brilliant blue sky. Out of the corner of my eye, I saw a little boy running along with a red balloon. He suddenly let go of the balloon! The wind took it and it floated over the railing and down to the water. Oh dear, his face… first it was total disbelief, then came the sadness. I looked at him and said “OH, NO”! He clouded up and rained just like a storm. His Dad, was quickly by his side, comforting him and telling him it would be ok. It was so sweet to watch. What happened next is another example of magic in the Universe. That balloon, floated up from the water, back over the railing, directly across the walkway and into the hands of the little boy! I swear on my grandma’s grave! OMG… I mean, I started looking around. Did anyone else see that? It was fantastic! The little boy’s face was just pure joy. That moment was right out of a movie. It was, in my mind, a complete example of heaven on earth. I sat for a moment, so humbled by this beautiful sight. I was out with friends the other night to see an off-Broadway play. Broadway plays are performed in the big theaters that hold 500 seats or more. Off-Broadway plays are performed in smaller more intimate theaters all over the city. Visiting these theaters is sometimes as good as seeing the play, as many of them are full of great architecture and character. This night was all impromptu. My friends called last-minute to ask if I would join them to see this play written by their friend. I immediately said yes and our adventure was under way. When we arrived at the theater, we took the “sketchy” elevator to the 4rth floor. The doors opened to this cozy living room with deep couches and an antique bar. After a glass of wine, we all entered the room that held the stage. The play itself was dark and heavy, but even though there were no big sets or props, we were all instantly transported into the world dreamed up by the author. It was amazing to see this snippet of another world created in the simplicity of an old theater. As the play finished, we all acknowledged the great acting and writing. Stepping out to catch the elevator down, the unexpected happened. The elevator was out of service, so we needed to take the stairs down to the street. As my friend opened the door to the stairs, I saw the most intricate and beautiful staircase! 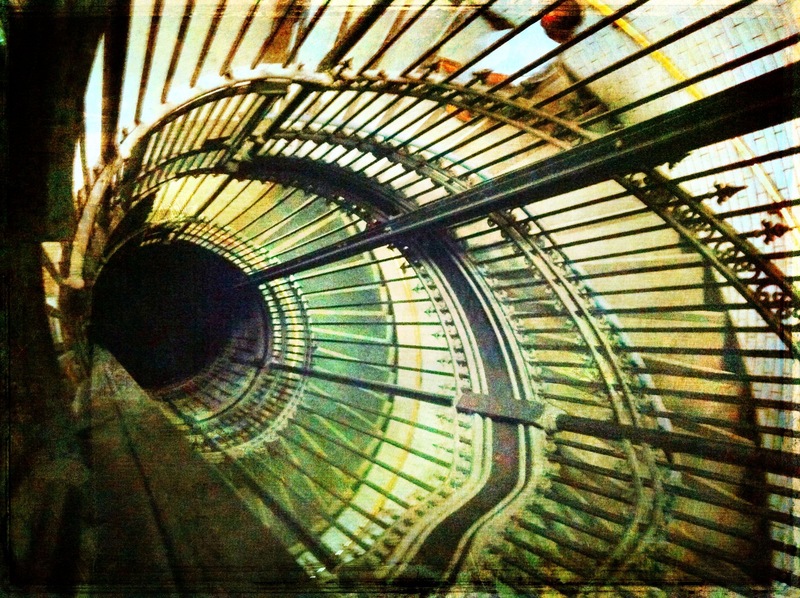 It was an iron cylinder with spiral, marble stairs wrapping their way down around it. WOW! I mean it was amazing. I spent the good part of the next 20 minutes trying to capture it with my iPhone camera. The detail and design were so unique. Even the aging process of the marble, iron and brass came together to make so much beauty. So… as I grew up in a very small town, in a rural community, I am by geography a farmer. Now, living in the big city, I still try to dig in the dirt as much as possible. I have a small garden on my patio, that I prune, plant and water. I have the most gorgeous rose growing in a pot. Its the kind of rose that gives these rouge colored flowers. I live to see this thing blooming. It starts to give blooms around May of every year and keeps producing well into October. She is a fellow spirit of mine and she gives me so much joy. The rose made me think of how we all go through periods of rebirth in life. I have had quite a few. I’ve seen people I love go through some tough ones as well. It seems very dark during that “pruning” process. Letting go of the parts of ourselves that die off is a natural process. You know what? It frees up our energy to birth something totally new. That is the beautiful miracle of rebirth. What kind of rebirth do you experience in your own life? Yesterday, I spent the entire afternoon at one of my favorite places in the world… the BEACH! It was just a beautiful day. There was a slight breeze, the water was warm and crystal clear, the sky was blue, the waves were gentle… You can visualize the day, right? It was heaven on earth. When I spend time at the beach, I always observe the beauty that is evident all around me. 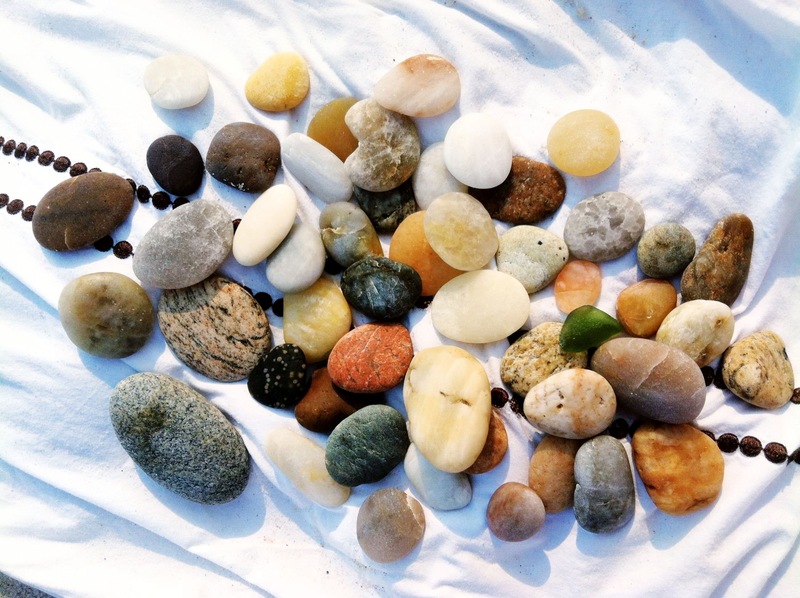 Yesterday, I became engrossed with picking up beach rocks, not shells, the rocks! What a day it was for my search. I found so much variety. There were all shapes, sizes, colors, textures, you name it. Each one was more beautiful than the next. While some were pure in color, they had beautiful shapes. Others were expertly colored and textured. The sizes ranged from tiny to enormous… can you see where I’m going with this? As I walked along picking them up for my collection, I was struck by how much these rocks reminded me of people. Each one was so unique and a complete masterpiece, just the way people are. Mother Nature has the most diverse palette and she paints each of us expertly. It’s our job to recognize uniqueness and beauty in each other. I know you are laughing right now! I mean, who doesn’t know that “WD-40” can fix any problem you have around the house? “WD” stands for water displacing and “40” indicates the number of tries it took them to get the formula right… but I digress, its lip gloss I really want to discuss! I have watched women of all ages, races, social status, and religion, pull out lip gloss and it apply it when they are in a pinch. This application of lip gloss fixes many common problems associated with womanhood. For example, did you know, when you are feeling extra blue, applying lip gloss will instantly pick up your mood. Some believe the heaviness in application, has a direct correlation to the mood of the wearer! Now I’m laughing. I’ve seen women reapply lip gloss in regular intervals, just as a protective measure. Young women think lip gloss makes them look so mature and older women use the reverse logic. Purchasing lip gloss, is as good as buying an insurance policy against the blues. What I like most about lip gloss is that it makes us remember ourselves for a moment. It’s a little kiss we give ourselves. Sometimes that little moment is more healing and uplifting than any gesture from our friends or family. So ladies, let the lip gloss flow! Buy extras, to keep in emergency locations, experiment with brighter colors and give it as gifts. The next time someone asks for a can of WD-40, you know what to hand them… your lip gloss! She said at a certain point you become wise, and you realize all the external stuff relating to beauty is just fluff and in this wise moment you become truly beautiful. She went on to share with me a tragedy that affected her very early in her life. It filled her with shame and kept her from really living in her own beauty. Her own wise moment followed a very challenging life circumstance.